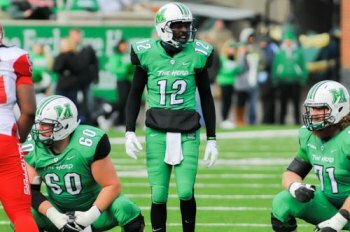 NEW ORLEANS – Rakeem Cato, the Marshall senior quarterback who has established all of the school’s career passing records, was named Wednesday as one of 11 finalists for the annual Manning Award. Cato will lead the host Thundering Herd (11-1) into Saturday’s Conference USA Championship Game against Louisiana Tech (noon, ESPN2) at Joan C. Edwards Stadium. It is Marshall’s second straight appearance in the C-USA title game as the East Division champion. The Manning Award is presented annually in January to college football’s top quarterback by the Allstate Sugar Bowl. Prior to the 2004 season, the Manning Award was created by the Sugar Bowl in honor of the college football accomplishments of Archie, Peyton and Eli Manning. It is the only college football QB award that includes the candidates' bowl performances in its balloting; therefore, it is presented annually following the completion of the bowl season. The winner is selected by a panel of national media covering college football, as well as each of the Mannings. Cato, of Miami, owns the NCAA’s FBS record for consecutive games with a touchdown pass, at 44. He ranks among the top 10 quarterbacks in major-college history in passing yards (13,490) and total offense (14,276) and his 126 touchdown passes rank No. 5 in FBS history. He threw for a school-record seven touchdowns in last week’s overtime loss to Western Kentucky. Cato was named MVP of the Herd’s Military Bowl victory over Maryland last December and has won MVP and Offensive Player of the Year honors in Conference USA in past seasons. He ranks No. 2 in C-USA history in all passing and total offense categories to former Houston star Case Keenum, and this season surpassed former Herd greats Chad Pennington and Byron Leftwich on the school’s career charts. Cato is the only QB in Herd history to pass for at least 30 touchdowns in three seasons. He is joined on the Manning Award finalists’ list by Ohio State’s J.T. Barrett, TCU’s Trevone Boykin, Colorado State’s Garrett Grayson, UCLA’s Brett Hundley, USC’s Cody Kessler, Oregon’s Marcus Mariota, Baylor’s Bryce Petty, Mississippi State’s Dak Prescott, Alabama’s Blake Sims and Florida State’s Jameis Winston.